It was a blustery, but absolutely beautiful May Day. 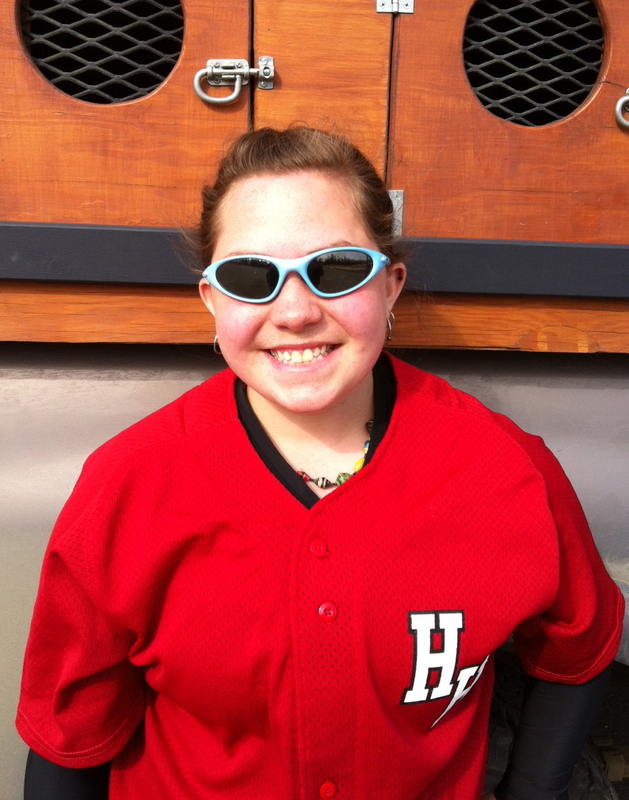 It was the start of the softball season for my daughter, Nicole. Nicole is a freshman at Houston High School in Alaska. A small school of just about 400 kids and home of the Hawks. A big change from where she was just last semester in Littleton, Colorado at Dakota Ridge, a school teaming with thousands of kids roaming the halls. Nicole has played softball since she was a little girl. Getting her start in T-Ball leagues at the YMCA I can remember those games like it was yesterday. My little girl is growing up and becoming a pretty dang good little softball player. I can only wish that it was those evenings playing catch in the park and the dad-daughter talks on the way home from practices when she played her first fast-pitch season in seventh grade with the Spartans. Last night she made me so proud. She is playing catcher on the J.V. squad and back-up catcher for varisty–as a Freshman! As the game got underway at 7:45 on a very cold evening, just 34 degrees. Her mom, her brother Tyler and I, shivered in the little bleachers gearing up to cheer her on. Smash the ball, Flea! It is a name we have called her since she was little. We are dog trainers, ya know. She was batting sixth. Not bad. Middle of the order. She got up to bat in the first inning and hit a line drive to the pitcher. She dropped the ball and Nicole made it to first but more importantly, got an R.B.I. The Hawks quickly accumulated two more outs leaving Nicole on third and rushing to the dugout to put on her gear. As she walked to the plate, in gear that was way to big, I am sure you could see my smile all the way to the outfield fence. It was time for Flea to show us what she has been learning the last month or so of practices, many of them indoors at the local Lion’s Club because of all the snow on the ground. The inning lasted forever, not the best pitching from these young high schoolers. But hey, it was the first game of the season and I am sure the butterflies migrated in droves to the Great White North. At the top of the second the Hawks were leading by a few runs. The batting order brought Nicole up again with one out and a full count. She swung and hit a line dive past the first baseman. She made it to first and held steady waiting for the next batter. On a wild pitch, she stole second and on the next pitch made it to third. Moments later Nicole was running towards home and slid into the plate like a major-leaguer. It was awesome! The bottom of the second proved to be tough work for Nicole and the pitching staff and Colony High scored several quick runs to take the lead 11-9. It was getting late and much colder for us in the stands. With the sun still very visible in the sky, the game was called for time at 9:21 pm. What a way to spend an Alaskan spring evening. Way to go Flea, you smashed that ball. We are so proud of you! Too bad for the loss and 34 degrees – dang. It was about 98 at yesterday’s game and it should be about that for tomorrow’s. Still, I think the pride and the exitment are the same for a father, no matter the temp. Wish Flea luck in the next game and try and keep warm. Thank you for your comment. Yes, you are right–no matter what the temperature, we are very proud!